Chemical processes in many fields of science and technology, including combustion, atmospheric chemistry, environmental modelling, process engineering, and systems biology, can be described by detailed reaction mechanisms consisting of numerous reaction steps. This book describes methods that are applicable in all these fields. Topics addressed include: how sensitivity and uncertainty analyses allow the calculation of the overall uncertainty of simulation results and the identification of the most important input parameters, the ways in which mechanisms can be reduced without losing important kinetic and dynamic detail, and the application of reduced models for more accurate engineering optimizations. 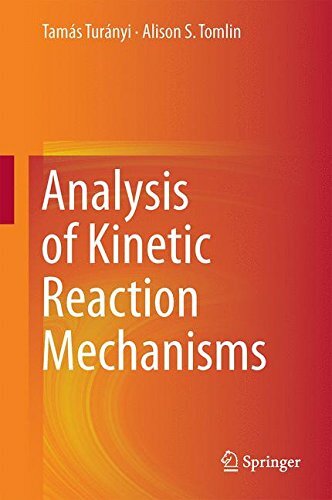 This monograph is invaluable for researchers and engineers dealing with detailed reaction mechanisms, but is also useful for graduate students of related courses in chemistry, mechanical engineering, energy and environmental science and biology. Abstract This chapter provides an introduction to the basic concepts of reaction kinetics simulations. The level corresponds mainly to undergraduate teaching in chemistry and in process, chemical and mechanical engineering. However, some topics are discussed in more detail and depth in order to underpin the later chapters. The section “parameterising rate coefficients” contains several topics that are usually not present in textbooks. For example, all reaction kinetics textbooks discuss the pressure dependence of the rate coefficients of unimolecular reactions, but usually do not cover those of complex-forming bimolecular reactions. The chapter contains an undergraduate level introduction to basic simplification principles in reaction kinetics. The corresponding sections also discuss the handling of conserved properties in chemical kinetic systems and the lumping of reaction steps. You may download here the complete text of Chapter 2. 7.2.2 Species elimination via trial and error. Burcat, A.: Thermodyanamic database at http://garfield.chem.elte.hu/Burcat/burcat.html. Cantera: An open-source, object-oriented software suite for combustion. In: http://sourceforge.net/projects/cantera/, http://code.google.com/p/cantera/. COPASI: a COmplex PAthway SImulator. In: www.copasi.org. DAKOTA: Design Analysis Kit for Optimization and Terascale Applications. In: http://www.cs.sandia.gov/DAKOTA/. FluxViewer: Visualisation tool for element fluxes. In: http://garfield.chem.elte.hu/Combustion/fluxviewer.htm. KINAL: program package for the simulation and analysis of reaction mechanisms. In: http://garfield.chem.elte.hu/Combustion/kinal.htm. KINALC: CHEMKIN based program for KInetic aNALysis. In: http://garfield.chem.elte.hu/Combustion/kinalc.htm. KPP: Kinetic Preprocessor. In: http://people.cs.vt.edu/~asandu/Software/Kpp/. laminarSMOKE web site. http://www.opensmoke.polimi.it/ (2014). Manion, J.A., Huie, R.E., Levin, R.D., Burgess Jr., D.R., Orkin, V.L., Tsang, W., McGivern, W.S., Hudgens, J.W., Knyazev, V.D., Atkinson, D.B., Chai, E., Tereza, A.M., Lin, C.-Y., Allison, T.C., Mallard, W.G., Westley, F., Herron, J.T., Hampson, R.F., Frizzell, D.H.: NIST Chemical Kinetics Database, NIST Standard Reference Database 17, Version 7.0 (Web Version), Release 1.6.7, Data Version 2013.03, National Institute of Standards and Technology, Gaithersburg, Maryland, 20899-8320. . http://kinetics.nist.gov/ (2013). MECHMOD: Modification of CHEMKIN-format mechanisms. In: http://garfield.chem.elte.hu/Combustion/mechmod.htm. NAG: Numerical Algorithms Group www.nag.co.uk. (2014). Nagy, T.: SEM: mechanism reduction based on simulation error minimization. http://garfield.chem.elte.hu/Combustion/sem.htm (2009). PottersWheel: Multi-experiment fitting. In: http://www.potterswheel.de/. PrIMe: Process Informatics Model. In: http://www.primekinetics.org/. REACTION\ANALYSIS: Software system for the manipulation of chemical information through statistics and machine learning. In: http://esblurock.info. Ruscic, B.: Active Thermochemical Tables (ATcT) http://atct.anl.gov/. SaSAT: Sampling and sensitivity analyses tools. In: http://www.nchecr.unsw.edu.au/NCHECRweb.nsf/page/BioModInfectDis. SBML-SAT: SBML based Sensitivity Analysis Tool. In: http://sysbio.molgen.mpg.de/SBML-SAT/. SBML: Systems Biology Markup Language. In: http://sbml.org/. SBMLToolbox: an SBML toolbox for MATLAB users. In: http://sbml.org/Software/SBMLToolbox. SBtoolbox: Systems Biology Toolbox for MATLAB. In: http://www.sbtoolbox.org/. SBW: Systems Biology Workbench. In: http://www.sys-bio.org. SimBiology: Model, simulate, and analyze biological systems. In: http://www.mathworks.com/products/simbiology/. Simlab: Software package for uncertainty and sensitivity analysis. Joint Research Centre of the European Commission. http://simlab.jrc.ec.europa.eu (2011). SUNDIALS: SUite of Nonlinear and DIfferential/ALgebraic equation Solvers. In: https://computation.llnl.gov/casc/sundials/. Tenua: the kinetics simulator for Java. In: http://bililite.com/tenua/.